Left on the voicemail of GoDucks.com writer Rob Moseley. 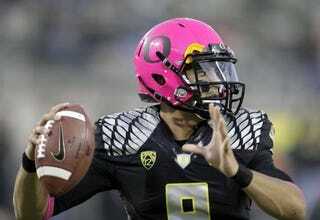 Background for the unfamiliar: Oregon wore pink helmets for their game against Washington State on Saturday. Not super-radical when you consider the Oregon color scheme over the last few years. Some of the helmets are being auctioned off this week with proceeds going to the Kay Yow Cancer Fund. Right now the helmets range from a low of $1,600 to over $10K for one signed by head coach Mark Helfrich and over $20K for one signed by Ahmad Rashad. O-Lineman Andre Yruretagoyena (@BigAndreAZDK): @DuckFootball we love supporting the cause. This arrogant moron clearly doesn't understand that as he sits on his couch swallowing twinkies.